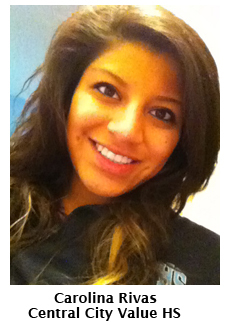 My name is Carolina Rivas and I am a senior at Central City Value High School. I went to the State of the City Address with a teacher and two students from my school. I enjoyed everything from the video of the mayor of all his achievements to his speech. I must say, my favorite part was when Mr. Antonio R. Villaraigosa shook everyone's hand on the end of the aisles, especially my teacher's hand because I was standing right next to him. I learned a lot from the Mayor's speech. I learned about the transportation projects the Mayor has created. I mainly focused on his education topic. It is nice to know that there is an increase in job opportunities because it makes me more secure that I can find a job after I obtain my college degree. I learned that he is creating a safer city that crime rates have decreased in the past years. I love it when he said that we need to celebrate our diverse city. And I also like when he stated that a student's zip code doesn't determine their education. I come from a low-income neighborhood but I am attending a charter school with a good educational system. And in 2005, he has doubled charter schools, and I can see that around my Los Angeles. It is also pretty impressive to learn that there is only three overcrowded schools in Los Angeles. He also included that students are moving forward, they're going places and I represent that! I will be a first generation college student going to Coe College in Iowa, Cedar Rapids with a full-tuition scholarship. On top of that, I have been selected for the Bank of America student leader paid internship and a paid trip to Washington, D.C. to meet Politicians, learn about our American government, and visit tourist sites. When the Mayor was talking about all the educational advancements I related a lot to it because I am going through what he was talking about! I learned that the Mayor is also planning to do another transportation project and try to make Los Angeles a little more environmental friendly. He also wants to keep pushing the educational system. He said that schools need a "No excuses mind set". He also wants to make sure that school's API scores rise, just like my high school's API score has risen throughout the past years. He also stated that there needs to be "No factories of failure". He wants the students of Los Angeles to succeed and keep raising the bar. He wants to unite Los Angeles, and make it a better place, just like the values of my high school. I loved one of his ending quotes, "L.A. is a city where miracles happen every day" and dreamers come here to make it a reality. I feel that I am a miracle from L.A., I'm a Hispanic, low-income student that has been given great opportunities, exploring the States, and being blessed with an advantage of going to a far, out-of-state, private, expensive college. I look back and I could of never thought I would of gone this far. It's because of the guidance of the charter schools and special college programs that I am where I am today.